A drawing of a young man, half length, drawing what appears to be a caricature of a head. The sheet has suffered damage and part of the left side has been repaired. A young artist is shown with a quill pen in hand, drawing a portrait or caricature on a sheet of paper held on his lap. The extravagantly wide hat obscures most of the artist’s features but what is seen of the face is finely and carefully drawn (unlike the exuberantly rough handling of the rest of the sheet) and was thus presumably intended to depict a specific individual. The drawing comes from an eighteenth-century album of miscellaneous head studies and is inscribed on the verso in an early hand ‘Anibal Caraza’.1 It conforms in style and subject to the sort of casual drawing of everyday life that was such a notable feature of the early Carracci ‘academy’ (see RCIN 902254, 902246). 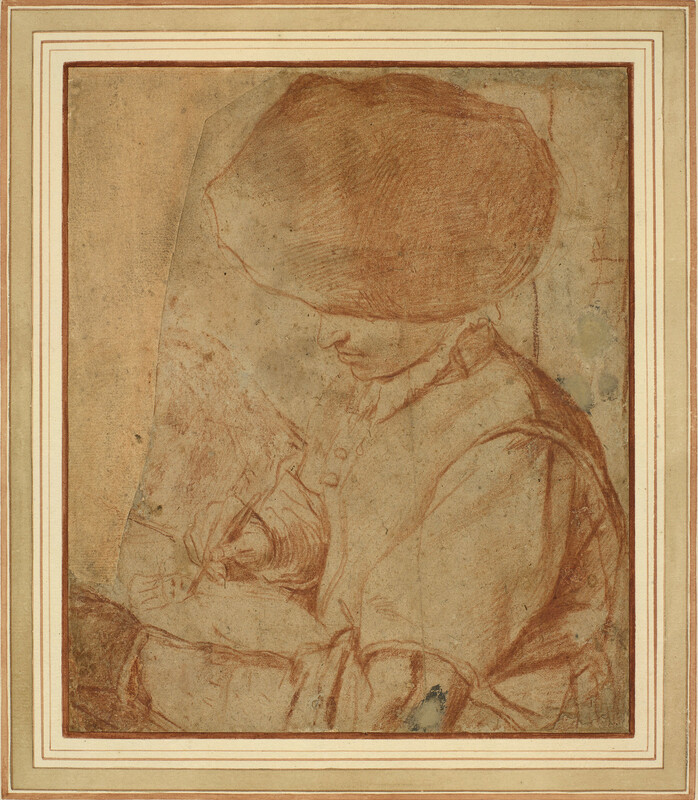 The drawing being executed by the young man is indicated by only a few lines, but sufficient to indicate a full-face head wearing a softly pleated high hat of a kind seen in other drawings from the Carracci studio.